Mix all dressing ingredients in a blender until well mixed. If this is a little too tart for your own personal tastes, add a little extra sugar. Cut off crusts of sandwich bread, and cut bread into cubes. Melt butter in small saucepan and add minced garlic. Toss sandwich cubes in the butter and spread out in a pan. Sprinkle salt and pepper and parsley flakes to taste. Bake for 15 minutes at 350°, turning half way through baking. I tried this and we really liked it a lot! I don’t think it taste like Olive Garden’s though. At first taste of the dressing on it’s own it was pretty vinegary, but when mixed with the fixings, it worked! My husband REALLY liked it surprisingly, so it must be good lol! Thanks! Anything that I can substitute for the corn syrup? It is good but there was wayyyy too much Italian seasoning. I would eliminate it all together and just add salt and pepper. I love the salad at OG but I don’t ever recall tasting mayonaise in their house salad dressing. Is this for real? It would be something I would omit. I thought their recipe was more an oil & vinegar dressing. Also wondering if there is a better substitute for the corn syrup or can I just leave it out. As a diabetic it’s not an ingredient I use. Hi Jaycee–I am not sure what their actual recipe is. I know the OG dressing I bought at Sams Club was more of a classic vinaigrette–but I didn’t really like it very much. I think you could leave out the corn syrup and use some splenda to sweeten. I hoped heat helps! I’ve tried this recipe and, while it’s nothing like Olive Garden’s salad dressing, it was still yummy. I substituted red wine vinegar because I find distilled vinegar a little too strong. I think if you were to double the corn syrup and double the cheese you’d get a lot closer to the real thing. Still, we loved it and ate all of it. thanks for posting the recipe1 I was craving for just this! Oh boy that looks so deeelicious! 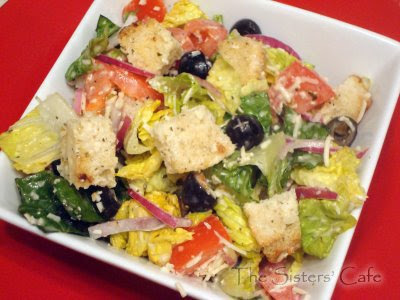 I love Olive Garden’s salad… now we just need a recipe for the breadsticks! Mmmm… I go to Olive Garden all the time just to buy their salad dressing. Now I guess I won’t have to! Thanks Er-Bear! Wow! Looks so yummy! I crave Olive Garden Salad often, and to now have the recipe to make at home. This is awesome! Can’t wait to make it. Thanks! Salad season is definetly here and this one just fits the bill!! I’ve never made homemade croutons, I need to try that!! Home-made croutons are the best! I love a good salad, and this looks delicious! Looks like a great salad! WOw that looks way better than even the real thing! :) can’t wait to try it!! Oh yum, I could go to Olive Garden and eat five bowls of their salad adn be perfectly happy. I’ll be trying this soon! Mmm Erin this looks so good!! I LOVE homemade croutons too! This salad looks so darn delicious! And those croutons. I just want to snack on them right this instant. Foccacia always makes the best croutons!! This looks so yummy that I can hardly stand it! I love homemade salads and dressing, especially during the summer. YUM!